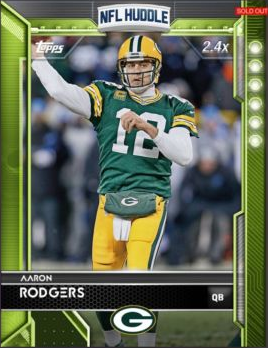 With the release of the purple mega set of 20 boosts this week, we saw that there was a reward for an Aaron Rodgers 2.4x boosted base card. Not only is this a step up from the 2.2x Purple, but it signifies that the green boost is likely going to be on the way shortly. Considering what happened last year, people are concerned, and I have some thoughts. First off, its clear that boosts are more popular in Huddle, as the contest scene is such a huge part of the game. They obviously are selling, as the cards keep coming, and sell counts have remained pretty consistent when the cards are in the normal pack format we have seen since the first OBJ boost. When they go into more of a different structure, the counts are all over the place, but still selling well. For those people that are upset that the boosts are being released in this fashion, im not sure I see why there is so much venom from individuals I know are buying the packs they are complaining about. The boosts will likely continue, and Im not someone that is unhappy about that. I like the boosts, as they do give a collectible nature to base variant type cards, and are worthwhile to have when playing along with the live games. At this point the novelty may start to wear off a bit, but lets be honest here – Topps wouldnt keep running the program if the cards sold like crap. At 2.4x, the green cards will not be the highest scoring cards in the game, as there are a few that score at 2.5x with a few set rewards. Of course, that could change in a matter of weeks, but there are only so many games left. Considering that the NFL season is so short, its not as big of a deal as people think. Last year, there were 500 copies of each purple that scored at 3.5x, and it made it impossible to compete with the big dogs without a number of copies of each card. At around 150-200 of each cards, the situation is very different. There were also more than double the amount of purples and double the amount blacks at this point in the year, and with only 50 and change total subjects floating around, its negligible. Almost 300 compared to 50? Pretty large change, all things considered. At this point, value is pretty much standard for most players, although QBs, WR and RB tend to be much more in demand than the defensive guys. I have chased down as many of the WR and RB ones, as they score the most when they get the ball, although QBs will be more valuable for a fantasy contest situation. Some of the boosts are crazy low in the card counts, mainly in ones that were given out as a bundle with the purchase of coins. Adrian Peterson remains the lowest count at 24 (set reward), but Julio Jones is close at 31. Those are going to be considerably more valuable and definitely more difficult to obtain. Players with upcoming nationally televised games should be targeted. This means, Thursday, Sunday night and Monday night. This is especially true for the WR and RB, who will get you more points on any play that they are given the ball or receive the ball than the QB. On a 20 yard touchdown pass play, a QB will get 3 points for the attempt, 5 points for the completion, and 3 points per yard (60) and 150 points for the score. That brings the total to 218, which is then multiplied by 2.2. On the other side, a receiver will get 5 points for the reception, 6 points per yard for the catch, and 200 for the score. This brings THAT total to 325, which is multiplied by 2.2. Its a comparison of more than 100 points, or 220 points with the boost. Chase the WR, not the QBs. Fantasy contests dont have cards attached to them, the showdowns do. The longer the pass play, the more likely that a COMMON receiver card will score more than a 2.2x or 2.4x QB. When trading for boosts, dont send golds or lower in trade for a boost, unless you are sending a TON of golds. The collectability combined with the rarity will override anything that a gold can bring, even if some users may be able to make that sacrifice. Boosts are inserts to almost everyone, and sending base will only get you some angry responses unless you are super lucky. Its not worth the risk. Because people are still overvaluing QB boosts, its easy to take advantage of people who dont know how points work. Otherwise, the boosts are pretty interchangeable. This is going to be a fun journey through the colors, I just hope that we dont get the odd names like Crimson and Sage like we did last year. Its time to stick with the primary color wheel names, not paint colors from home depot. I dont need a midnight navy boost, thank you!